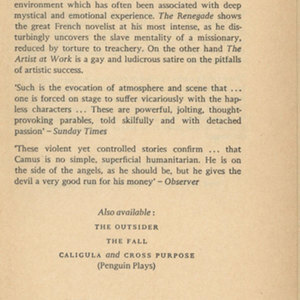 This page describes another of Camus' works, and identifies it as "one of the vital works of our time." 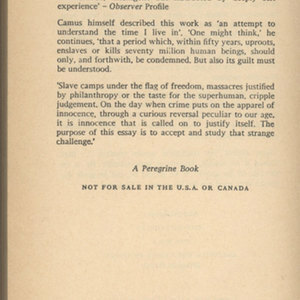 This page also identifies that this particular iteration of The Rebel is "not for sale in the USA or Canada." This ad centers around an add for Camus' Exile and the Kingdom. There is a brief description of the book and some reviews. 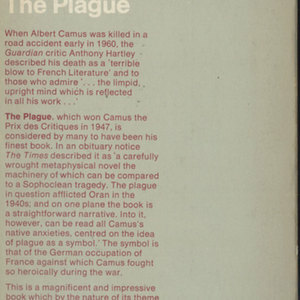 At the bottom of the page is a blurb that states these other books are "not for sale in the U.S.A."
The first ad appearing in the last few pages of The Plague. 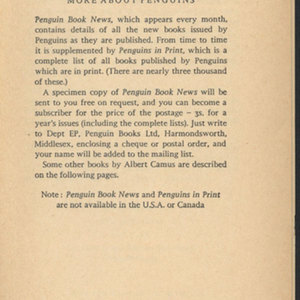 This is the first of three ads for different books published by Penguin Books. 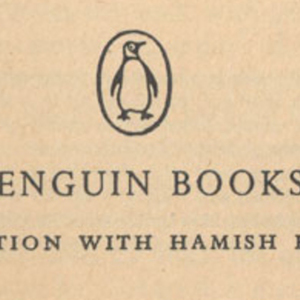 This page describes Penguin books as a whole, and gives a description of a service that can be subscribed to (only in the UK). 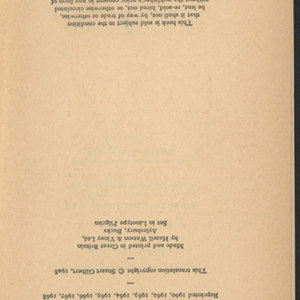 This is the back of the novel, and in the bottom left hand corner it states that this edition is not for sale in the USA.